Do you like curries that bring back memories and tease your palate. I am that one hopeless foodie who dreams of curries all the time. Especially the regional ones that have regional spice blend or a homely touch to the recipe. And one of my favorite curry from the list of favorite is Shev- Tomato Rassa bhaaji. The name itself spells out the ingredients of the curry. 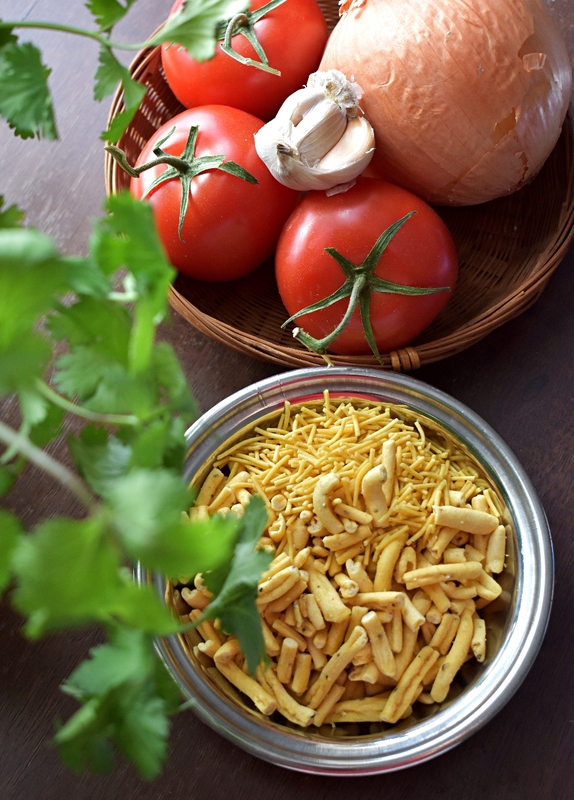 This curry has Shev (fried crunchy gram flour noodles) and tomato playing the main characters. This curry mostly made appearance when we ran out of fresh veggies. The dish has gravy of onions and tomatoes and a thin layer of Shev/gaanthiya is sprinkled on to it before serving. All of which are readily available in the pantry. Just make the Shev bhaaji and serve it with hot rotis, and your cooking woes are sorted. The basic ingredients in this curry is Tomato and Shev. 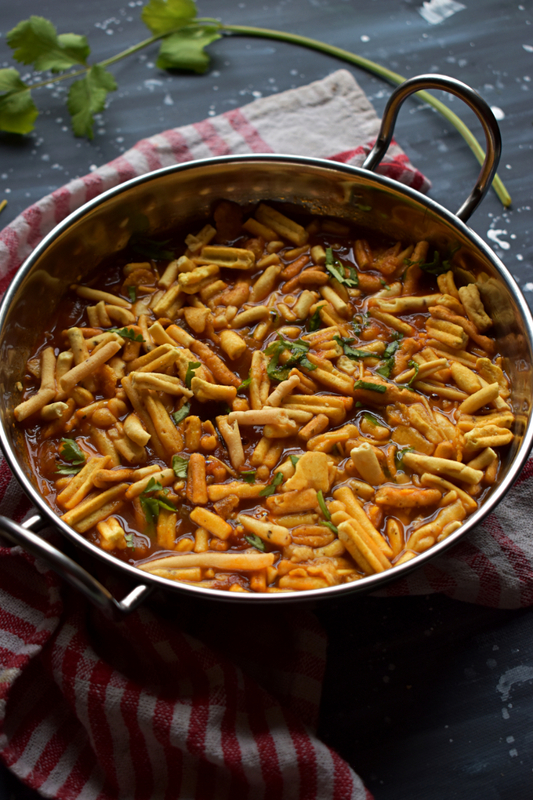 Shev is basically fried gramflour noodles for those new to it. It us usually used in making tea time snacks. Another major ingredient used is the Goda masala. This masala is widely used in the Maharashtrian household. You can check my Goda masala recipe for details. There are many versions of this Bhaaji and the taste changes everytime you use a different spice blend. Ideally Shev Bhaaji is oily and spicy but I have made less oil version because I don’t fancy too much oil into my food. Feel free to add some more oil if you feel my oil quantity is too low. 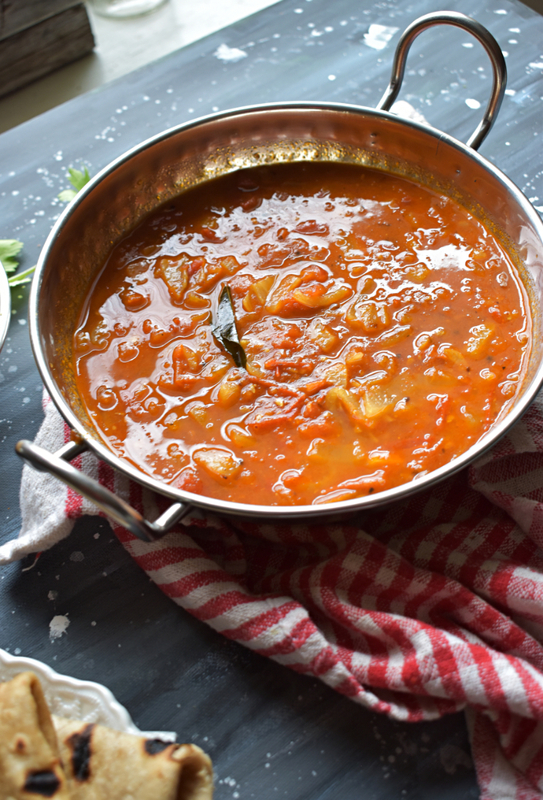 Shev tomato bhaaji is the spicy curry that you would like to eat along with rotis on a cold day. 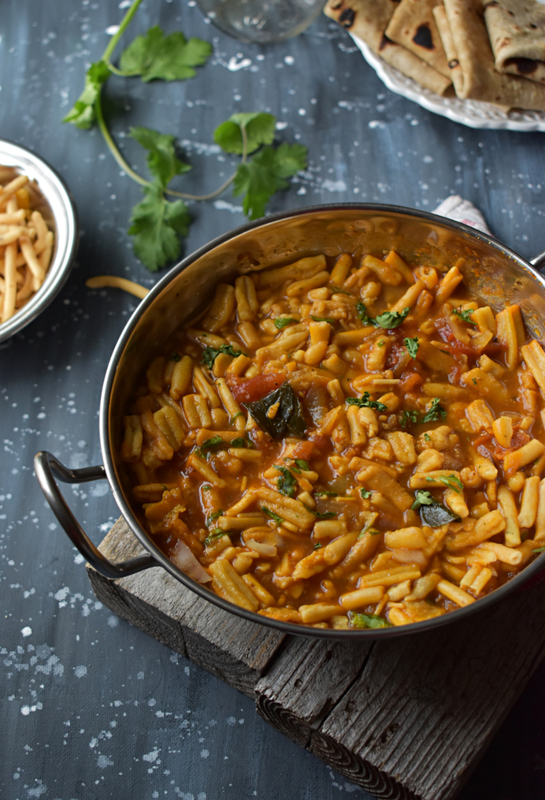 The crunchy shev and the tomato curry makes your palate burst with flavors and textures. In a medium sized deep saucepan, heat 1 tbsp oil on medium flame. Add onions and roast them until they become translucent. Then add tomatoes, chopped garlic and ginger and let it cook for 5 mins. Transfer this mixture to a grinder and blend it to a fine paste. You can add ¼ cup water when grinding. Meanwhile in the same pan heat rest of the oil on medium flame. Once the oil heats, add mustard seeds and let it crackle. Add curry leaves and red chilies. Once the curry leaves are roasted, add turmeric, hing and the paste of onion and tomatoes to it. Stir everything together and add 1 cup of water. Add goda masala, salt and chili powder, adjust the taste. Stir everything together and let it simmer until rolling boil. Once done, turn off the flame and let it sit. Transfer the gravy to the serving bowl and add shev to it. Let the shev slighlty soak into the gravy and then start eating. You can add onions and tomatoes without making a paste. Just add chopped onions and tomatoes to get chunky texture. If you are having a bad day or craving for fancy food, you can definitely give this recipe a try. Serve this bhaaji when it’s neither too hot or not too cold. Pair it with hot phulkas or rotis and they just change an ordinary day into an extra ordinary one.